Solar panels are setup to be wired in series. Pretty sure I want parallel, no? So for my application I planned on just wiring battery bank in parallel .I was surprised that the panels are set up to run in series. I'm only using 2 panels so the controller can handle I gather and step it down? Or do I want to wire in parallel? Or will them wired in series be good and fine to go through controller and charge my bank .I was just worried that much voltage might be much but if controller rated for 150v I'm fine I guess .trying to wrap my head around this stuff. Forgive me . Thank you. Also, I was told by a neighbor that I don't need a circuit breaker between the PV panels and Charge controller because if one panel shorts it will only be able to draw it's capacity from the other good panel. But if there was more than 2 it would be all the working panels surging power into the shorted one and possibly overheating and starting fire, damaging other panels, and controller. But that with just the 2 panels I will be ok with just circuit breaker between controller and battery bank to prevent any charge going back into controller. My inverter has a built in fuse but I eventually still want to get breakers between panels and cc and between battery and inverter. I plan on upgrading over time as I have 12, 24 v 220 watt panels. Only 4 deep cycle FLA batteries @101ah @ 1a. But my application is not much load. Phones, cell phones n lights. Occasionally flat screen but not too often. I plan on upgrading to better batteries and more of them, as well as larger amp charge controllers and step up voltage, etc. But for now just keeping cabin lit and phones charged for most part .but, considering what I was told would you agree I am ok without a breaker between panels and controller with them being 2 panels at 220 watts and 36.6 open circuit voltage equaling 440 watts and 73.2 volts? Could it possibly spike higher than open circuit voltage more than controller can handle at 150volts? 2 panels in series, with temperature allowance for -10F, only gets you to 96V, so you are safe, and so solar overvoltage spike is not an issue. to determine the wire size and protection you need. The protection (fuse or breaker) should be near the power source (battery) to protect the wire - this protection is not optional. Thank you for youre reply and advice. I was confused when the manual for charge controller recommended a 63a breaker for the 40a. I actually was recommended by a neighbor to use #8awg. 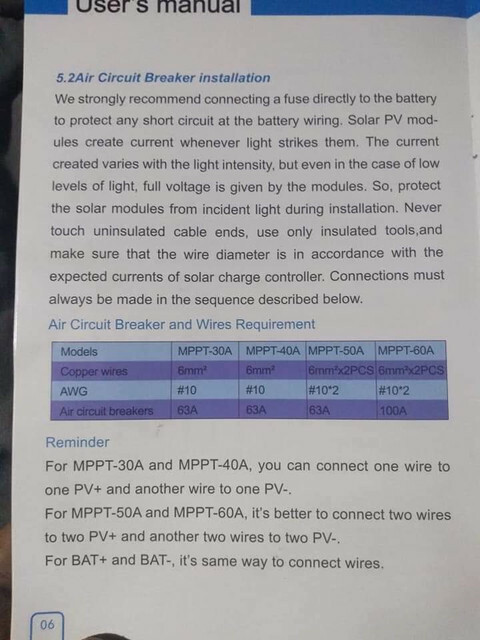 So does the breaker between battery and controller serve no purpose at all considering it will allow up to 63a of current when controller can only handle 40a? Is there not protection for a little higher voltage built into controller? I guess I have to wait and order a 40a breaker? In any case, how near to battery bank do I want a breaker? I have CC mounted on wall in the cabin. Had initially planned on putting breaker box right under CC and battery bank is on the ground maybe a foot and half to two feet below that. Is that too far from battery bank? Thank you kindly for any advice. I really appreciate it and hope I don't come across dense. I've learned alot already in the past couple months I've been reading up on the topic. Doesn't show I know, as I find myself coming across something new pretty much constantly, but all good things in all good time. Look forward to learning more and have better understanding and be able to help others. Forgive and bare with me plz as I find my way. Hehe. cheers. Here are specs for controller as per manual. I am here to learn and appreciate your sharing of knowledge . I have a question regarding the statement above. I was of the understanding that you need overcurrent protection on each leg of parallel panels is you had three or more parallel strings. That made perfect sense to me. If one shorts it needs protection from the other two. If the practice is not to start fusing parallel strings until you hit four. . ... I don't understand.... Could you give me a clue? I had a typo, and reworded it to : more than 2 panels/strings in PARALLEL 2 in parallel are just fine, when you add a 3rd, you can have troubles. Fuses or breakers, go as close as possible to the power source, batteries always being the biggest power source , so the protection goes close to them. you can buy switch rated (means you can turn them off and on and not damage them) DC breakers at other places too. So got it hooked up today finally and it seems going Good so far. It's even a lil cloudy todat and charging good. I think but a couple things not sure of. Couple questions. I have my 2 panels in series .they are coming in around mid 50 volts atm give or take .I'm a little confused I guess about the lcd display and whatnot. I was under the impression that because my battery bank is wired in parralel and only 12 volt system it would show only as much as I programmed to take in, which was 14.3. I guess it's ok as it's seeming to regulate and keep the batteries floating going out to batteries. 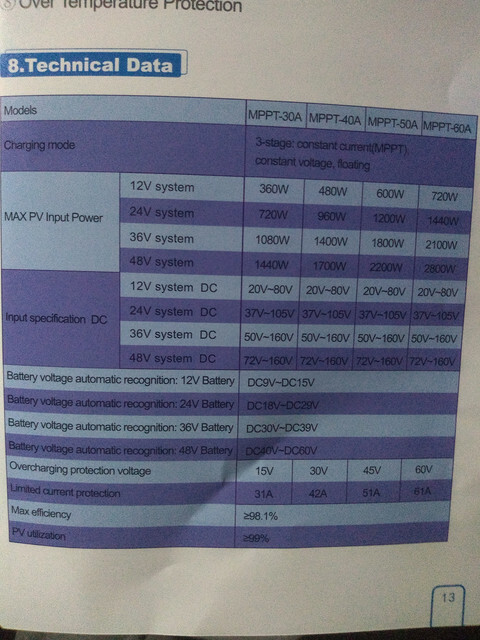 I'm wondering if this is true mppt as I was under the presumption that mppt controller would display a fixed PV input voltage and wattage after finding said mppt point. Or is it just that it takes the fluctuations and just regulates them out at a more steady rate? I had my batteries bank of 4 deep cycle batts in parralel at a full charge from the generator so I still yet to see how this thing and under more of a load, and also, like I said it's cloudy today. But atm I'm happy it looks like even a cloudy day I can get enough power to keep my batteries at a decent level hut the test will be once I start really using the batteries and needing to recharge after bringing down night before. Another question is about a blinking red led in the housing behind the fan. I am curious and concerned about what it might be an indicator of. I looked all over online and can't get a straight answer .Certain brands and different models indicate different things for different colors and modes. The manual does say when all set up, it goes into self test mode and RUN lamp (under the fan inside of casing) will flash every one second. It flashes when just hooked up to batteries so, I gather it's just an idication of power supply? Just would think it would be a green light and red would indicate something wrong. Many models a blinking red light might mean not enough current. Or too much. Or low vattery .or overcharged .it's a shame at the beginning of the game there wasn't some kind of standard in what led colors and blinking patterns meant universally. I went to call the company and it's in China and my phone prompted me to accept charges so, not likely getting much in help there . The one screen that's is supposed to show error codes is good so hoping everything is good. I'll try to upload pics of the status screens showing PV and battery numbers. Also, while I was typing this, with sun going down, voltage dropped to like upper teens and there was no more wattage reading, and wasn't pushing out to the batteries. If the panels were producing more than the floating parameters set, why wouldn't it continue to push out? Battery was floating so I would understand shut down but then battery drop again and still didnt push toNumbers were fluctuating so wondering if that was a factor .I gather I'll know for sure tommorow as it's dark now. Thanks for any and all help. All times are GMT-5. This page was generated at 12:46 AM.